Can You Gain Weight With Magnesium? Magnesium is an essential mineral that plays a role in more than 300 functions in your body, many related to the way you metabolize energy. As a mineral, it has no calories and can't directly cause you to gain weight. In fact, not getting enough magnesium can interfere with your normal function of processing sugar and insulin and lead to unwanted weight gain. Getting adequate levels of magnesium actually supports a healthy weight, high energy level and strong bones. Magnesium assists your body in chemical reactions that support muscle and nerve operation, control of your blood glucose levels, regulation of blood pressure and protein synthesis, essential to muscle development. Internal organs, particularly the heart and kidneys rely on magnesium, and it's an electrolyte, which helps the muscles fire optimally during physical activity. Your teeth and bones contain much of the magnesium in your body, as the mineral supports their structure. 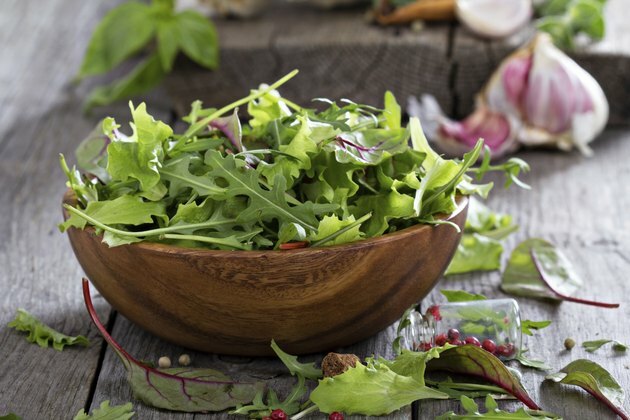 You can get magnesium from a number of foods, including leafy green vegetables, legumes, almonds, potatoes and soy milk. The University of Maryland Medical Center contends, though, that many Americans are mildly deficient. Signs of magnesium deficiency include anxiety, restless leg syndrome, insomnia, irritability, abnormal heart rhythms, low blood pressure and muscle weakness. Weight loss or failure to thrive are not symptoms. Increasing your intake of magnesium-rich foods could improve your energy and mood, but it won't necessarily help you gain weight unless you eat more calories than you burn. If you think you might be deficient and need a supplement, talk to your doctor before adding one to your diet. Magnesium plays a role in the metabolism and directly affects sugar and insulin processing. Poor levels of magnesium are often found in people with type 2 diabetes, especially those who are overweight. A meta-analysis published in a 2013 issue of the Journal of Nutrition concluded that people with higher magnesium intakes usually have lower fasting glucose, or blood sugar, levels and insulin. High blood sugar and insulin tend to affect weight gain. So, if you have adequate magnesium levels, you may be better able to manage an overweight or obese status. Instead of supplements, use larger servings at meals and calorie-dense healthy foods to promote weight gain. Some of those foods could be magnesium-rich options, such as leafy greens, black beans, avocado, peanut butter and cashews. Aim to add 250 to 500 calories of your daily caloric needs for maintenance to add 1/2 to 1 pound per week. Also adopt a strength-training routine that has you training every major muscle group at least two or three times per week. This helps encourage the development of healthy muscle tissue, rather than just an increase in body fat.